Healthy eating habits along with regular moderate exercise are mainstays for a sound lifestyle and a long lifespan. To establish a healthy eating pattern, it is important to understand the types of food and the nutritional requirements of our body. Foods we eat can broadly be divided into three types: Energy rich foods, body building foods and protective foods. As the name suggests, energy rich foods are the ones that provide our body and mind with the much-needed fuel required to perform the daily activities in personal and professional lives. Foods that can be categorized as energy rich are high in carbohydrates and fats. Carbohydrates are the primary and instant source of energy for the body. They power every system in the body, including the brain, heart, muscles and internal organs. They can be classified into simple or complex based on the complexity of the sugars they contain and the number of steps required to break them down before they can be utilized by the body. Simple carbohydrates are absorbed readily and enter your bloodstream very quickly. They act as instant fuel. They should generally be avoided except in high activity states, as all excess carbohydrate gets converted to fat and gets stored in the body. Complex carbohydrates take time to digest and get absorbed and provide a more constant source of energy. Foods such as whole grain breads, brown rice, whole wheat pasta and vegetables contain complex carbohydrates and other important nutrients like vitamins and minerals. The other source of fuel for the body is fat. Body uses fat as a source of energy once all readily available carbohydrate is exhausted. Body building foods are the ones that make our bodies strong by helping build the muscles and bones and help in the repair of damaged or aging tissues. Protein containing foods are the primary source of body building foods. 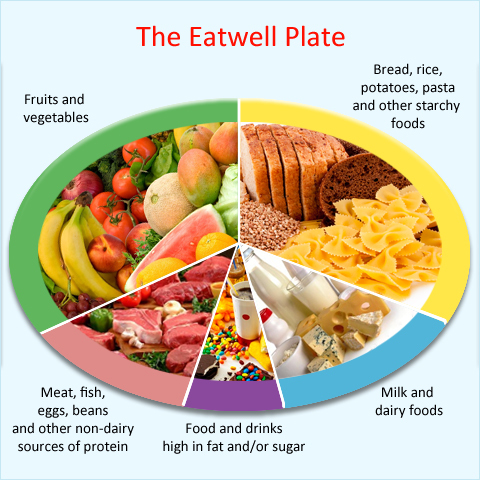 A low protein intake can lead to poor health, tiredness, fatigue and muscle wasting. 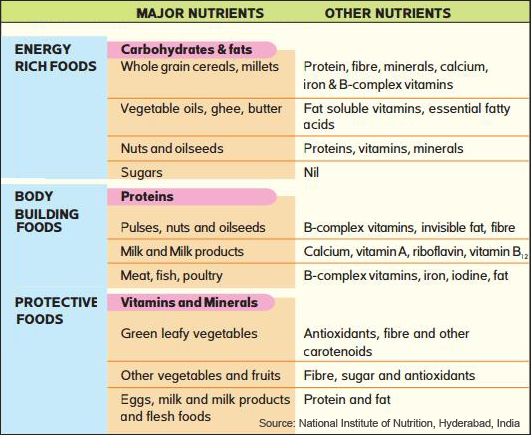 Meat, fish, poultry, lentils, beans and milk products are the primary sources of protein. Protein is also present in a variety of vegetarian diets comprising spinach, cauliflower, mushrooms, pulses, nuts, amaranth, grains and oilseeds. Protective foods, as the name suggests, help in keeping the body free from harmful infections, deficiency disorders and cancers. Some of these nutrients are also vital for essential functions in our cells. Protective foods contain generous amounts of vitamins, minerals, and other essential nutrients and provide a natural defence against a wide range of diseases. These foods also contain abundant antioxidants that neutralize free radicals. Free radicals are byproducts of aging and metabolism and if unchecked, can cause tissue damage and cancer like conditions. Whole vegetables of different groups and colours, fresh fruit, nuts and grains are the primary sources of essential vitamins and minerals. Spices and green tea are a good source of anti oxidants. In order to grow strong and remain healthy, it is necessary to choose foods from each of the groups every day. While choosing your food: Aim for balance, look for variety and practice moderation.